It’s good to be “home” again. And by home, I mean Grecia, a bustling market town of about 16,000 on the west end of Costa Rica’s Central Valley. 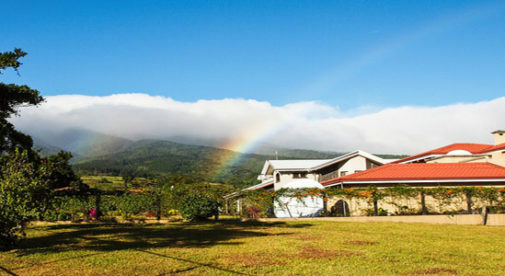 When my family and I first moved to Costa Rica two years ago, it was the first place we lived. the town square in front of the famous red metal church full of families, young couples, playing children, and senior citizens…the friendly shopkeepers and neighbors…and the rolling hills outside town covered in sugar cane and coffee. The slower pace of life in Grecia was quite a change from our previous home in South Florida, well-known for its traffic, go-go-go lifestyle, and high cost of living. Yet, we moved away—first to Tamarindo, a beach town on the northern Pacific coast, because we kind of missed the beach, and then to Escazú, a suburb of the capital, San José, to be closer to the hospital there when my youngest son had a medical issue. 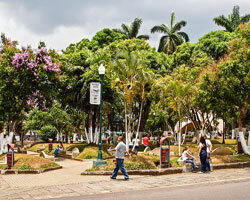 We liked both places, especially Tamarindo with its super laid-back atmosphere and close-knit expat community. And sunset drinks on the beach with friends, of course. But for us, nothing ever measured up to Grecia, a town that has been attracting foreign retirees—and, increasingly, young couples and families—for years. And when the opportunity to move back came up, we jumped on it. We’re about 15 minutes outside of town, on the slopes of the Poas volcano. (Don’t worry it’s in no danger of erupting anytime soon.) It’s an area popular with expats known as El Cajon. But it’s mostly Ticos (as Costa Ricans call themselves). And, because it’s a semi-rural area, you get a real mix. One Costa Rican neighbor who works in Grecia is a civil engineer who moved here for the peace and quiet. Other neighbors brave the hour commute and work in San José. But just a few lots down is a medium-sized coffee plantation that’s been there for generations…and we can see cattle pastures up the hill. Grecia, a town popular with expats, offers a fantastic lifestyle with a low cost of living. Our property is on a ridge overlooking a small forested river valley. Our view extends to the town of Grecia and the farmland that surrounds it, as well as the tall mountains that rise dramatically in the distance. Most days, I spend at least five to 10 minutes just taking it in, whether with a cup of coffee in the morning or glass of wine in the early evening. We spend a lot of time outdoors. With the temperature in the mid-70s every afternoon and the sky so blue, you’re kind of obligated to. Of course, in the rainy season, starting in May, we’re expecting regular afternoon showers. But we know from experience it’s not that bad and the rain really brings out the green in the vegetation. So we feel like we’re back home, where we belong. And if we miss the beach…well, the Pacific coast is just an hour and a half away.